President Trump has been demanding that his aides draft a plan to reduce the swelling budget deficit while simultaneously ruling out virtually all categories of possible deficit reduction and demanding new deficit-increasing measures of his own. The Washington Post has plenty of hilarious details from the administration’s internal fiscal deliberations, such as they are. Trump comes across as possessing every bit as much fiscal acumen as you would expect from a man who managed to bankrupt a casino, required hundreds of millions of dollars in secret cash infusions from his father to stay afloat, and can barely absorb written material of even the shortest length. The Post’s account draws heavily from the perspective of Trump’s current and former advisers, who treat his buffoonery as the central cause of the administration’s fiscal straits. But the reality is that Trump is simply expressing a more ignorant version of standard-issue Republican budgeting. The deficit is the gap between revenue and outlays, and Trump opposes any increase in revenue under any circumstances whatsoever. 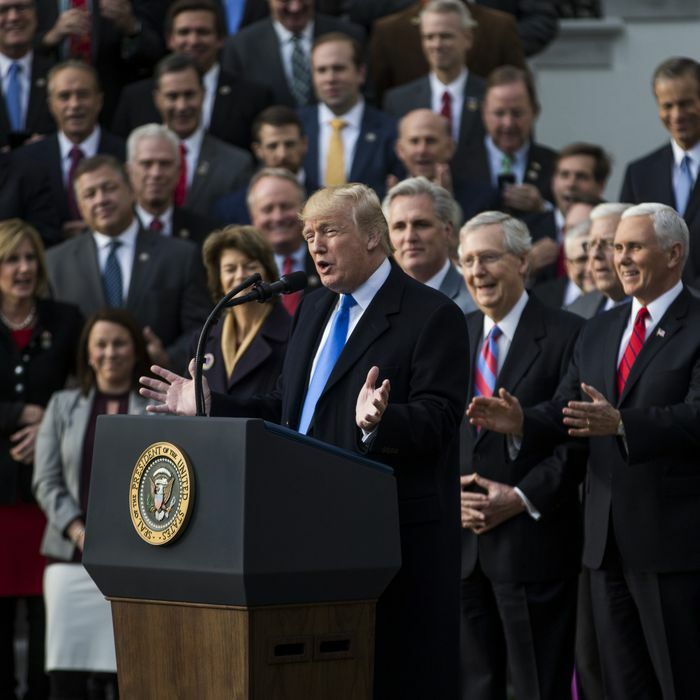 The story notes that Trump “has said no changes can be made to Medicare and Social Security,” and has boasted about his increase in spending on defense. Those categories, plus interest on the debt, account for 80 percent of federal spending, and the remaining 20 percent has been targeted by desperate budget-cutters for the better part of three decades. When you refuse to increase the revenue side of the equation (and, indeed, make it worse through tax-cutting), and rule out four-fifths of the spending side of the equation, you’ve ruled out any reduction to the deficit. It is fair to say that no other Republican president would be quite this ignorant. But in other ways, Trump is indistinguishable from the policies any Republican advocates. Trump’s refusal to consider higher taxes is a point of uniform party dogma. In 2012, when the Republican presidential candidates were asked if they might support a budget deal with ten dollars of spending cuts for every dollar of higher taxes, every single one said no. If Trump came out for a tax increase he might literally be impeached and removed from office. The story notes that Trump “has said no changes can be made to Medicare and Social Security.” But every Republican likewise supports maintaining retirement benefits for workers at or near retirement (meaning age 55 or above). By definition this would rule out even the first penny of budget savings within ten years. And only a handful of Republicans support any cuts to the defense budget. Trump’s inherent Trumpiness is not the reason the deficit has increased. The iconic Republican Ronald Reagan cut taxes, jacked up defense spending, and massively increased the deficit, and his presidency is worshipped as a model all subsequent Republicans must follow. Reagan’s successor, George H.W. Bush, did break from his party in order to reduce the deficit, and conservatives loathed him for it and use his apostasy as a cautionary tale to this day. The next Republican president, George W. Bush, promised to follow Reagan’s example rather than his father’s, and he delivered, jacking up defense spending and cutting taxes and causing the deficit to spike. Trump has signed onto legislation designed by Republicans in Congress that increased defense spending and cut taxes. The deficit has risen as a result. That’s what Republicans do. The other part of Republican policy is formally denouncing deficits and insisting that the deficit increases their party systematically engineers are not their fault. Trump’s comical ignorance of budget policy makes him a useful scapegoat for this purpose. But the reality is that fiscal policy is one area where the president’s complete ignorance is irrelevant to the outcome.